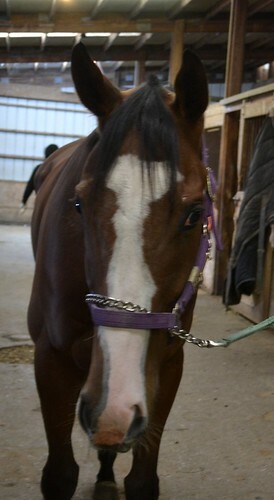 This flashy young gelding is sweet, cute, quiet, and eagerly accepted our peppermints. He is well put together with a strong shoulder, has clean legs, and is described as sound with no vices, and a good horse to handle and work with. He has 2 wins in 15 starts with an additional 5 top three finishes. 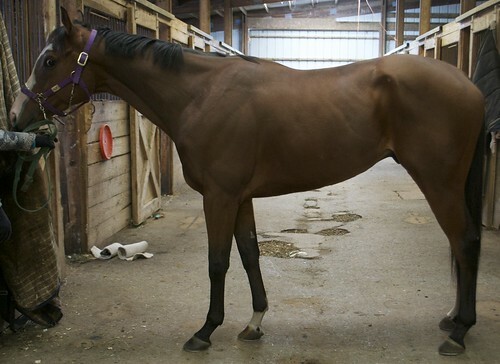 He came out of his last race in mid-October a bit body sore, so his trainer gave him a break, but now realizes that there is not any time left in the Finger Lakes racing season to fit in another race, and he is will not be competitive at the tougher track in New York where the trainer’s racing string goes for the winter. 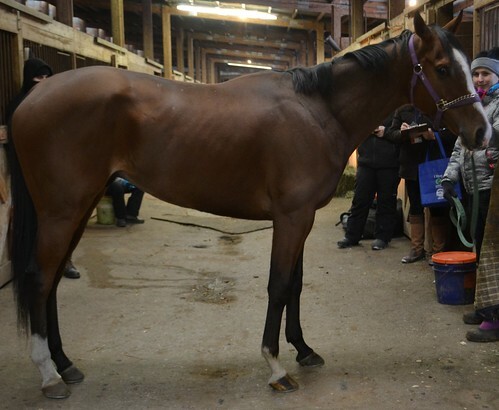 But the decision to let Hard Way Winner move on from racing is your gain, because this cute moving and kind young gelding can go in so many directions for a new career.He was perfectly behaved on a frigid day even though he had not been able to get out to do anything for several days due to bad weather. He jogged politely (we had to jog him indoors because it was icy outside) and showed off very cute movement at the trot. SInce he is only three and still growing, he is likely to get a bit bigger. 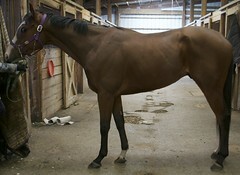 He is by Songandaprayer, who is a son of Unbridled’s Song. His dam is by Caerleon, a European champion who is a son of Nijinsky. 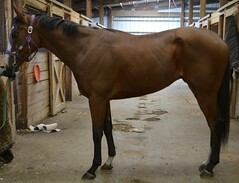 This turf oriented breeding on his dam side bodes will for sporting disciplines.